Depression and anxiety are a big deal at ASU. In fact, 40.9% of students have reported feeling so depressed that they feel it’s difficult to function. In October 2017, Perla Martinez stood in front of a microphone and told her story publicly for the first time. She spoke of moving to America at 5 years old to escape violence and poverty in Mexico. She talked about living in fear of deportation. She was scared to tell her story at first, but she was fueled by her anger at the uncertainty surrounding life as a DACA recipient. DACA recipient Edder Martinez poses for a portrait on ASU's Tempe campus on Feb. 14, 2017. 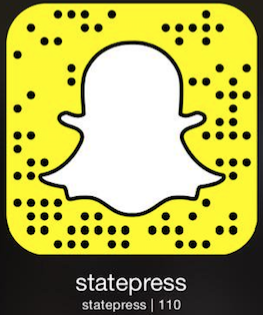 Welcome to the fourth installment of The State Press Politics Roundup, where we bring you the week's coverage of on-campus and local politics. Since Sept. 5, when Attorney General Jeff Sessions announced the recision of the Deferred Action for Childhood Arrivals, or DACA, Ruby Rivera has been taking things "day by day." Rivera, an applied biological sciences senior and DACA recipient, has tried to live her life normally, despite the possibility of deportation. USG Tempe passed a bill on Tuesday, Feb. 13, 2018, that would increase the Student Health and Wellness Fee. The aim of this bill is to increase access to campus resources. There has, however, been some debate over the cost of this bill. On this episode of Forks Estate, podcast editor Morgan Willis talks with politics reporter Tina Giuliano to find out more. "Joe Arpaio wants DACA recipients to be deported." Illustration published on Thursday, Feb. 8, 2018. In this podcast, Cassandra Laubach discusses how the opioid crisis is affecting people who live in Arizona with State Press politics editors Andrew Nicla and Fortesa Latifi. Former Maricopa County Sheriff Joe Arpaio announced his bid for the 2018 Arizona Senate race last month. ASU alumna Reyna Montoya was named on the Forbes 30 Under 30 list for her work with Aliento, the service and arts organization she founded to advocate for youth affected by immigration laws. DACA supporters hold a candlelight vigil for the DREAM Act outside the Republican Party headquarters in Phoenix on Jan. 22, 2018.